When you run a busy restaurant or commercial kitchen in the Mid-South area (including Tennessee, Arkansas and Mississippi), your risk of fire is considerably higher than normal businesses. And as commercial kitchens continue to modernize and get more efficient, the fire risk grows. Modern improvements that increase fire risks in commercial kitchens include cooking appliances that heat up faster and cool down more slowly as well as increased use of vegetable-based cooking oils that get much hotter, much faster. In such a dangerous environment, having a working fire suppression system in your Mid-South restaurant is crucial to your business’s operations and for the safety of your employees and customers! State Systems, Inc. offers installation, inspection, maintenance, repair, and replacement of commercial kitchen fire suppression systems. We are a highly experienced and trusted fire protection company in Arkansas, Mississippi, and Tennessee. Call us at 866-308-5701 or contact us online for more information or to request an estimate. In the past, kitchen fires were one of the greatest causes of restaurant loss, and they remain a serious threat today. With a properly installed and regularly inspected fire suppression system in your commercial kitchen, you will be able to safely and immediately respond to any fire emergency—protecting both life and property within your restaurant. Kitchen fire suppression systems work by a process called saponification, which essentially turns burning grease and oil into soap, stopping the fire quickly and making it easy to clean up. Besides keeping your space clean, your commercial kitchen fire suppression system is your number one defense against potentially devastating fires. If you need a commercial kitchen fire suppression system installed in your Memphis area restaurant, call State Systems today or click here to contact us. You need a kitchen fire suppression system that can protect the many hazard areas in your restaurant and perform all the necessary auxiliary functions if a fire strikes. We proudly distribute and offer installation and maintenance services for Ansul, Pyro-Chem, Range Guard, Guardian and Kidde Fire Systems and will work with you to find the best solution for your restaurant facility and needs. State Systems is a proud Ansul Double Diamond Alliance Partner and our licensed technicians specialize in the installation of the following Ansul systems, among others. The Ansul R-102 Liquid Agent System is the best protector and defender of today’s kitchen equipment, and you can choose from two design options. The first is the appliance-specific design. With the appliance-specific design, the most efficient fire protection is accomplished when nozzles are selected and aimed at specific hazard areas on the appliance. The second design option is the overlapping appliance protection. When flexibility and simplicity are the main priorities, nozzles are placed in a straight-line arrangement, providing overlapping agent discharge patterns. The only agent-plus water fire suppression hybrid on the market today, the PIRANHA dual agent system employs the best firefighting attributes of two extinguishing agents: the fast flame knockdown and securing power of wet chemical and the fast cool-down capability of water. The system provides protection for settings such as casual and fine dining, fast food chains, culinary schools, sports complexes and stadiums, and four- and five-star lodging facilities. 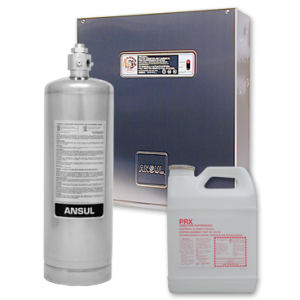 We can work with you to determine the best Ansul fire suppression system to install in your Mid-South commercial kitchen or restaurant. We are also an authorized installer of Pyro-Chem fire suppression systems. This manufacturer has a comprehensive line of clean agent systems ideal for commercial kitchens. The Pyro-Chem Kitchen Knight system meets the primary challenges faced by today’s restaurants and offers the protection you can trust and afford. The Kitchen Knight II Restaurant Fire Suppression System meets the main challenges of today’s commercial kitchens. With an advanced liquid extinguishing agent and system designed for virtually any situation, this restaurant fire suppression system is protection you can trust and afford. Contact us for an estimate on a Pyro-Chem system installation today! Kidde Fire Systems also has an extensive line of fire suppression systems tailored for commercial kitchens. All Kidde systems, which we can install, exceed UL 300 and NFPA standards and can be customized for your property or space. The Kidde WHDR Wet Chemical System offers 24-hour automatic or manual protection for commercial cooking areas, including ducts, plenums, hoods, and cooking surfaces. The system’s wet chemical agent is designed for quicker flame knockdown and faster suppression. This Kidde restaurant fire suppression system offers unmatched coverage, with fewer discharge nozzles and flow points, meaning reduced installation time and cost. Guardian systems provide fire suppression for residential stoves in institutional kitchens. Facilities which require residential stovetop fire suppression include daycare facilities, break rooms and multi-person housing facilities such as dormitories and assisted living communities. The Guardian fire suppression system is the original and most trusted UL listed system on the market. The Guardian systems automatically detect harmful flames and instantly extinguish them with a chemical potassium acetate agent and keep the fire from reigniting by automatically turning off the gas or electricity to the range top. For more information on any of these high-quality kitchen fire protection systems, call us at 866-308-5701. The importance of commercial fire protection cannot be understated, and having your kitchen fire suppression system inspected regularly by a licensed fire protection company is just as important as proper installation. We provide inspections and repair services on all types and brands of restaurant fire suppression systems. Contact us today for an estimate or inspection! Helping companies throughout Arkansas, Mississippi, and Tennessee, State Systems, Inc. seeks to embody its mission of protecting life and property into every client and product every day. Long-known in the Mid-South for its family-owned leadership and life safety systems, the company’s longest-standing and best-known services – such as emergency lighting installation and fire protection equipment – have been enhanced by new technology services such as network integration, structured cabling systems, and wireless support. With years of proven experience in designing and fitting clients with engineered systems, State Systems is committed to finding the right solution for you. Whether you need a stand-alone product or a custom-fitted total integration system, you can trust State Systems to provide top-of-the-line products backed by a highly knowledgeable and dedicated staff. Start protecting your commercial kitchen today! Contact us online, or dial 866-308-5701 for reliable fire protection in Arkansas, Mississippi, and Tennessee.